Finally. It’s done. For real this time. It’s fixed, it’s blocked. What can I say about this that I haven’t already said? Now that it’s freaking hot outside it’s seems a bit heavy for a sleeveless tank. I’ve noticed when I sit it tends to wrinkle around the waist, not every flattering. I think I’ll still wear it, though. Yesterday was my first day off from the Library in over two weeks. Tonight I have to work at the winery but it was so nice yesterday to know I didn’t have to get up and go to work this morning. Working that many days in a row was starting to mess with my head, I couldn’t keep straight what day of the week it was. Anyway, on to the WIPs! 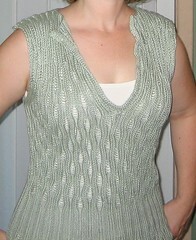 First up my new project the Lace Tank from the Summer issue of Vogue Knitting. Unblocked lace not much to look at, I know. But there’s the start of it, I cast on this morning. Next up the Check Board Throw I’m making for my niece, for Christmas. It’s coming along nicely I just need to run to Hobby Lobby for more yarn. I don’t think that actually breaks any knit from the stash rules. 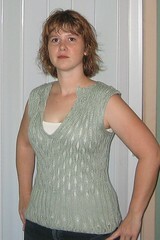 The Drop Stitch Lace Tank from Fitted Knits, done except for blocking which I will get to this week. I really like this top, but it seems, well, heavy. I guess that would be the Pima Tencel. Mentionable is just awaiting a visit from my mom so she can help me mark where to put the straps, she’ll be here tomorrow. So I need to hurry up and decide on the stitch pattern I’ll use for them. 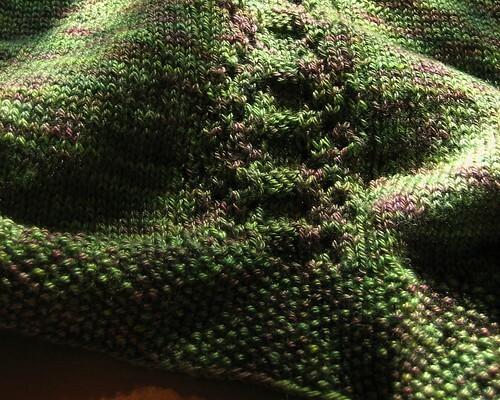 I’m thinking seed stitch on the smaller needles I used for the top. BTW it’s almost impossible to get a decent self pic of this yarn. When it’s completely done I’ll have to recruit someone to take pics for me. 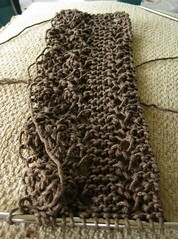 Scarf w/edging 21 & insertion 25 pg 100 is coming along nicely. I do love the Victorian Lace Today but it would have been nice if they’d come up with some more interesting names for the patterns. Happy Knitting and have a great Fourth, I’m back to the knitting chair to listen to Harry Potter and knit away. Remember the Dollar n Half Cardigan? It’s on hiatus. I put it aside for several reasons, I needed something portable to take on the train, I think I’m going to frog so I can have stockinette vs reverse stockinette. Yeah, yeah that was 2 months ago, whatever. I think I’ll start working again soon, but don’t hold your breath. Yes, it’s the Drop Stitch Lace Tank I still haven’t fixed it. But I will. I swear! Mentionable , I am working on this a little every evening. I’m getting close to finishing the body. What’s that? More crochet? Yep! It’s the start of a Farmer’s Market Bag for me. In pink, cuz pink rocks and I rock. Scarf w/edging 21 & insertion 25 pg 100 from Victorian Lace Today. Love it! Love knitting lace. Plus easier than I thought. This is my first real lace project Look out lace here I come! Soon I be swathed in lace knit shawls, hankies, collars you name it! Ok not really because we all know I don’t actually knit that fast. btw – I made a major error and you can see it in this picture if you’re really looking. Rather than frog I’ve opted to call it a design signature and keep going because it’s a scarf and I don’t think it will be obvious. And something is, although I’m not sure you can tell from this angle. 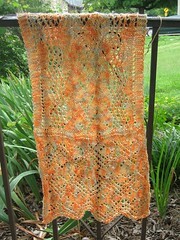 I didn’t realize it until I had blocked the Drop Stitch Lace Tank, something was wrong. I figured out what it was and took it to Sit n Knit this week to see if they could tell too. They could. One side of the front has 6 more rows, or one more pattern repeat. I’ve known about this for weeks which probably explains my lack of desire to knit. 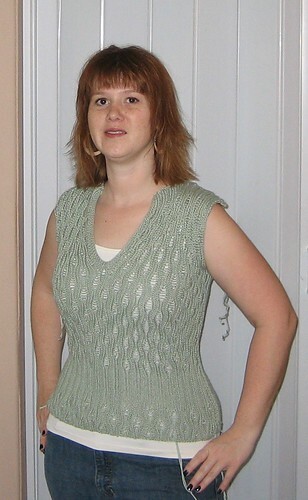 If I want to wear this, and I do, I have to find the ends, unseam the shoulder, rip back and add 6 rows to the other side. Right now I can’t even bring myself to look at it, I do want to wear it this summer so maybe next week I’ll bring myself do deal with it. In the mean time I’m still working on Mentionable , but it’s not really photo worthy. I also start this bag with some Sinfonia I had in my stash, I’m also going to make the small size and I’ll be making a third bag from a pattern in my head. I’ve had bags on the brain and was looking for one to knit (and one to sew more on that latter) so when I saw this free pattern in my Knitpicks flyer it felt like fate. I’m planning to give two of them away as gifts. It’s comfort knitting, if I make a mistake on these it wont be the end of the world, plus I’m using stash yarn. I’ve been working way on the Drop Stitch Lace Tank but with bazillion inches of ribbing the pictures weren’t very exciting so I’ve been sparing you the details. Last night I finished the back and picked up the neckline and sewed it together! 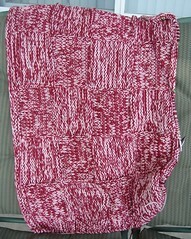 I haven’t even started weaving in the ends, but here is what it looks like. 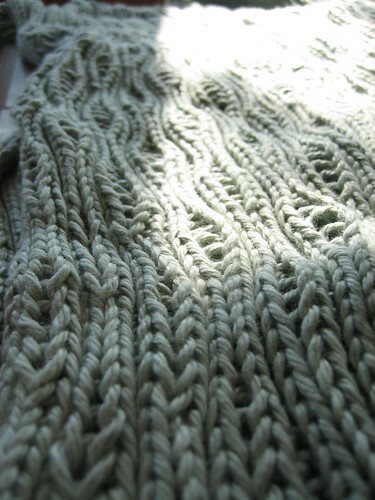 I did use the needles and the yarn the pattern calls for. I did not do a gauge swatch (I know!) Normally I have to go up two needle sizes to get gauge but I’m glad I didn’t I wouldn’t want the stitches to be any looser. 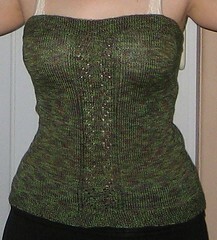 I also didn’t want to add buttons so I wait one more pattern repeat to separate for the neckline. I made the 28 inch size, I probably could have gone up one size and it would have been longer, but fit about the same. It’s so stretchy I think it would fit no matter what but it pulls up on the length. I’ll definitely wear, I just need to weave in the ends and block it. 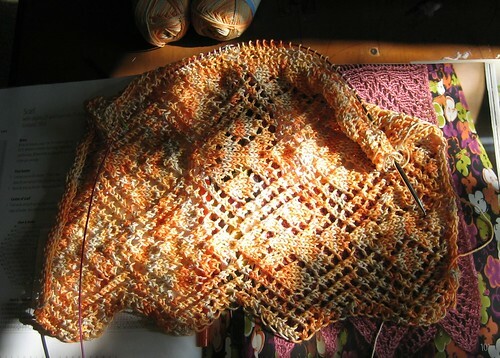 I completed the front of the Drop Stitch Lace Tank and started the back, but it’s slow going because the K2 P2 ribbing for the whole back is not the most inspiring knitting. I really like this pattern and despite frequent doubts about length, stretchiness etc, I do think it will look good on me. So far the only alteration I’ve made is waiting one more pattern repeat to split the sides. Since I’m going to have to wear a cami under it anyway I thought I’d leave the buttons off and this way I can. 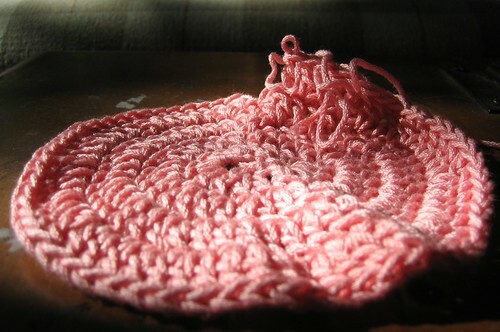 But I’ve learned something from it – yarn matters. Not just the fiber and texture and feel, but color too. Yeah I should have realized this, but I didn’t really think about it. I like the Pima Tencel just fine, it’s the color, I think this will look good on me when done, but it’s not the most exciting thing to be doing 15 inches of ribbing it (it’s hard to get a good picture of the color, it’s a light green) Especially when I swatched for Mentionable last night! 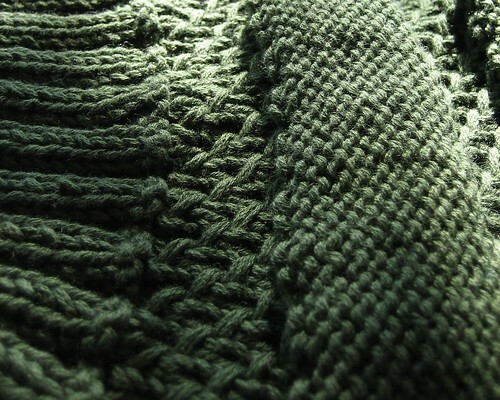 The yarn is beautiful! I know, I know! I shouldn’t be starting it but I have a good excuse! I’m taking the train to Kansas City this weekend and I need knitting to take with me! I don’t want to take the tank because I know I”ll finish it and that means packing two projects, this way I can only pack one! I’ve never ridden the train before but I can knit in the car (only when some else is driving!) so I’m assuming I’ll be able to knit on the train. See it’s totally justifiable! Plus I’ve had that kit forever and after see how Lara‘s turned out I just had to start it. 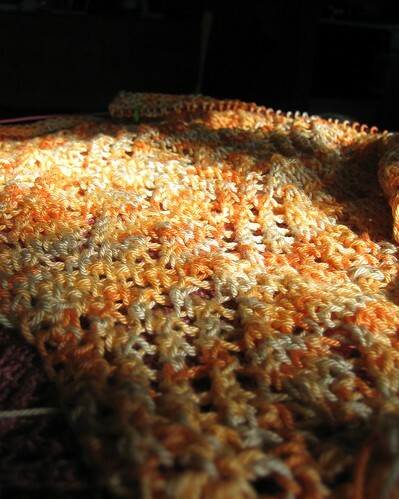 The yarn is just gorgeous! Yes it’s not over! Just when you thought you’d seen the last of winter, it returns! Foolish lulled into thinking Winter had surrendered by 80 degree temperatures, I packed up my sweaters, turned down the thermostat and welcomed Spring. But I forgot Winter is devious and stubborn and would not give up so easily. It has returned! We were down below freezing for the last several nights, despite covering my rose bushes, azalea, peonies and more I fear I’ve lost them. I am not a happy camper, Winter and I have an tenuous relationship at best and I fear I my never recover from this latest assault. Thanks to a comment left by Robin last week I signed up for a virtual book club. I waffled about it for a couple of days, but I looked at the books they had read, I’d read some of them (and liked them) and wanted to read most of them. Plus I have been wanting to read their newest selection – Water for Elephants . I think this will give some balance to my reading. I co-host a Current Issues book discussion at work, I tend to read non-fiction on my own time or listen to whatever I can get my hands on as audio book. 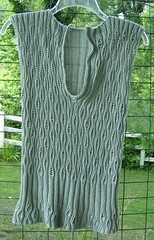 In Knitting News : I’m almost done with the front half of the Drop Stitch Lace Tank . I can’t decide how I feel about it. It is stretchy and should fit when done no problem, BUT I keep feeling like it will look awful on me, but I’m continuing anyway. I was so tempted to abandon it for something else this weekend, but I’m not ready to deal with the 1.50 cardi again, so I stuck with it. Since I’m not a fast knitter two WIPs is all I’m allowing myself to have going at once.